Editing your paper will help you to ensure the clarity of your argument. Chapter 10 of the Guide to Academic Success, “Advanced Editing”, has advice on editing that is relevant to a range of legal documents.The following materials are adapted from the LAWresources website, the Legal Academic Skills Centre website and the Guide to Academic Success. It can be difficult to objectively assess your own work. Nevertheless, it is important to review your drafts multiple times to ensure that your argument is clear and concise. Before making significant changes to your essay, it is a good idea to save it into a new document – this way you won’t lose anything important. Bear in mind the main argument of the essay and the purpose of the relevant section. Think about your reader – use signposts and clear language to make it easy for them to read. Be precise in terms of word choices and phrasing. In particular, ensure that you are using words consistently throughout your essay. Qualify and support every argument that you make. Specific->general or general->specific. You could discuss a single case and its broader effects, or discuss general issues and then their application to a particular case. It is a good idea to signpost the structure of your sections, and, if relevant, explain why you have chosen that structure. Bear in mind that these structures are merely common examples – if you can think of a creative (but still logical) way of structuring your essay, by all means do so. For example, you might want to structure you essay so that each section focuses on critiquing one component of a particular legal rule. These structures can also be used for individual sections as well – for example, you may want to discuss the development of a common law principle in Australia in chronological order, and then go on to compare and contrast the development of a similar principle in Canada. You can create a list of the topic sentences of each paragraph using Outline View in Microsoft Word. This will give you an outline of the work that each paragraph is doing. This will also allow you to check whether each paragraph is (a) serving a purpose, and (b) discussing only one main idea. Once you have ensured that each paragraph has a clear purpose, and that each paragraph builds towards your conclusion in a logical manner, you should ensure that the paragraphs also ‘flow’ into one another. 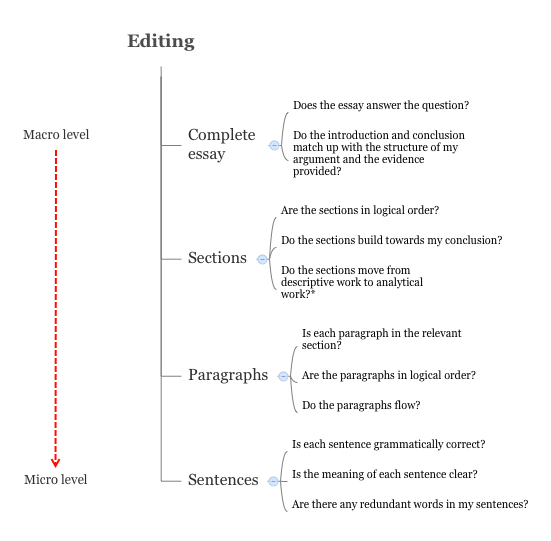 Give your readers a clear idea of what each paragraph is going to argue, as well as how it fits into the overall structure of the essay. Once you have ensured that the sections and paragraphs of your essay fit together nicely, your final step should be writing your introduction. Ensure that your introduction matches the structure of your essay and clearly sets out what you are going to argue. Ensure that each sentence is as clear as it can be. It will often take several drafts before your sentences achieve this. Be aware that often attempts to make your essay more interesting to read will make it harder to understand – if this is the case, always go for clarity over creativity. Your language should be both clear and appropriate. “Clear” language means that words should be used consistently, and in accordance with a defined meaning. Generally speaking, it can be dangerous to try to make the essay more interesting by using synonyms for important legal terms. If you define the meaning of a word for the purposes of your essay, ensure that you adhere to this definition throughout. “Appropriate” language means that you should be using accepted legal terminology. Using a legal dictionary can help with this. Use the minimum number of words to express what you need to express. Weaker legal essays tend to confuse wordiness with eloquence. Go over every sentence and determine whether the same ideas can be expressed using fewer words. Eliminate or combine sentences that repeat ideas. The reader should be left in no doubt as to what each sentence is trying to express. If your sentences are precise and economical, odds are that they will also be clear. Nevertheless, consider whether there is any way that your sentences could be clearer. This can include using passive rather than active sentence structures, using parallel sentence structures for related sentences, being clear about who or what each sentence refers to, and being cautious about the use of pronouns. Further excellent tips are available here. An excellent resource for editing has been developed by Chantal Morton, based on materials created by the University of Melbourne and the Legal Academic Skills Centre, available in the LMS LASC Community Guide to Academic Success folder and by clicking here. An excellent resource for improving the clarity of your sentences (and writing in general) is the Purdue University OWL. If you need/want a refresher on the rules of grammar, there are several sources. The University of Ottawa’s Hypergrammar website is very well laid out and easy to navigate.